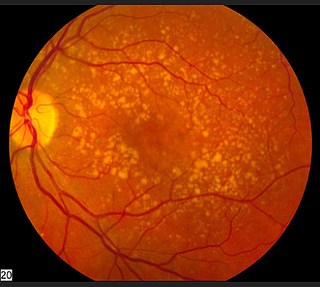 Wet macular degeneration is a retinal disease that leads to vision loss, but not blindness. This type is less common than the dry form and occurs in about 10-15 percent of age-related macular degeneration (AMD) cases. 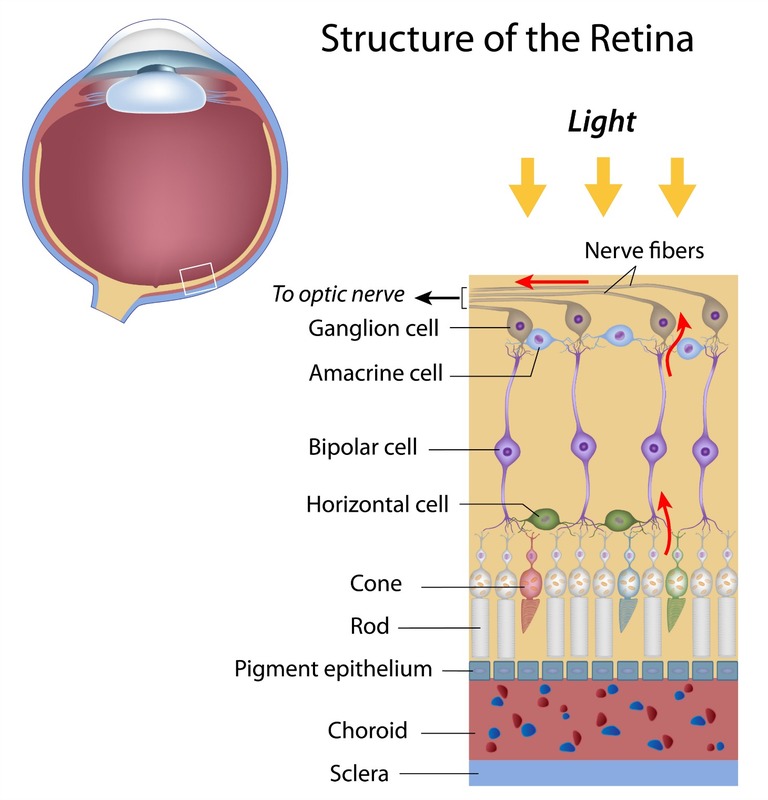 There are several processes going on in the retina that lead to the degeneration or dying of the photoreceptor cells in the macula. Because these cells are responsible for our sharp, detailed vision and our straight ahead vision, when these cells degenerate or die, vision becomes blurry, straight lines appear wavy, and colors are less vivid. Find out more about the symptoms of wet macular degeneration and the common causes of this macular disease. You may be wondering why the word "wet" is used to describe this type of macular degeneration. The "wet" is referring to the fluid that has built up or flooded the photoreceptor cells. This fluid is coming from abnormal, fragile and tiny blood vessels that have developed under the macula and retina. Because these blood vessels are fragile, blood and fluid leak out of them causing damage to the photoreceptor cells. The fluid also affect's one's vision because it raises up the macula so instead of laying flat it is bulging. This bulging then leads to this distorted vision - where fan blades take on weird shapes, telephone poles look crooked, etc. These new and leaky blood vessels grow in the choroid layer of the retina. √ Bruch's Membrane is the inner most layer of the choroid. It acts as a blood-retinal barrier and as a support structure to the choroid. √ The choroid is made of blood vessels and capillaries and is the only source of blood to the macula. The wet form results in more severe vision loss than the dry form. 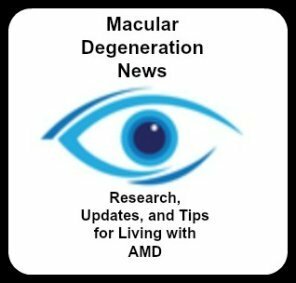 But dry AMD is the more common or prevalent type of age related macualr degeneration. There are many changes in vision for those who have wet macular degeneration. One's vision is no longer sharp and distinct, colors are dull and glare can be a problem. The most common symptoms of wet AMD are blurred vision, straight lines look curvy, and a gray smudge right in the middle of one's vision. Many people often find that one day, when they are looking at something that should be straight - like a fence, it appears distorted and strange. This sign of macular degeneration is the result of fluid building up under the macula (hence the name wet AMD). 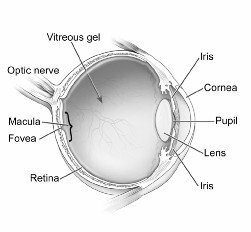 The macula normally lies flat, but when fragile blood vessels leak fluid, the fluid gets under the macula causing it to lift up which leads to the distored vision. Photoreceptor cells are damaged by the flooding of fluid as well. Cone cells which are highly concentrated in the macula become damaged and die. 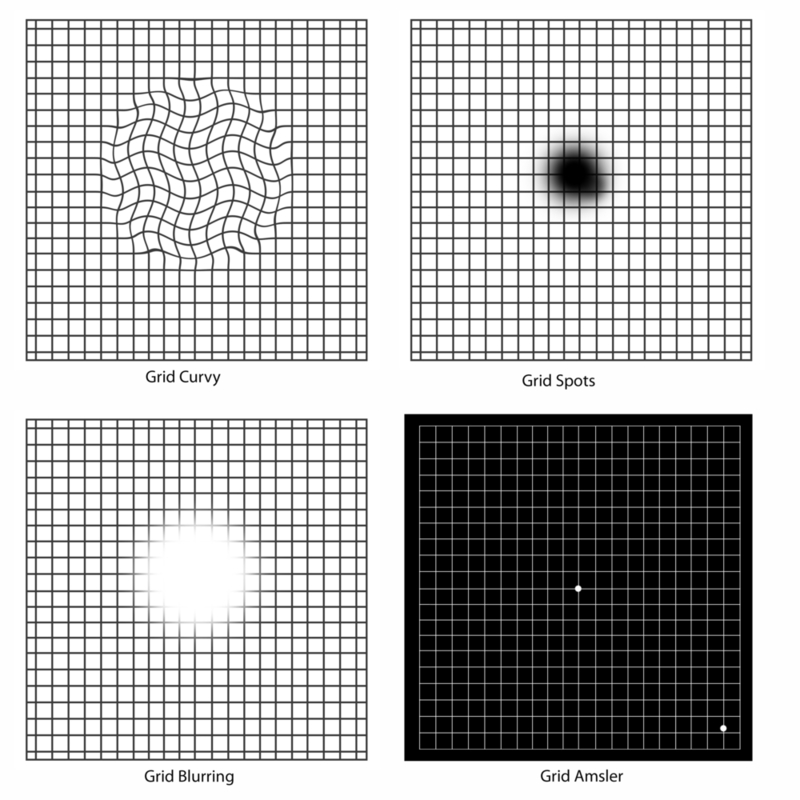 As the cone cells die, vision becomes less distinct and sharp. However, one of the most severe symptoms is a spot that appears right in the front of one's vision. The spot can be small or large, blurred, black or gray. This blind spot is called a central scotoma and interferes with one's ability to see what is right in front of them - such as seeing facial expressions, reading a bill, or checking a price tag. A disciform scar is another name for a macular scar. This scar forms on the macula, the center of the retina, in those with advanced macular degeneration. If you've been diagnosed with wet macular degeneration or choroidal neovascularization (CNV), you may have heard your physician use the word "macular scar." This scar usually forms as a result of end stage wet macular degeneration or choroidal neovascularization (CNV). End stage means that the leaking or bleeding has stopped and has left this fibrous scar in the macula. Usually vision remains stable at this point. When this scar develops there is a a permanent blind spot called a scotoma. This means that you will experience a black "hole" or spot in the center of your vision. Your peripheral or side vision is usually not affected. There is no treatment or procedure at this time that restores this lost vision. The vision loss to straight ahead vision is severe, but at this point usually the bleeding has stopped and the vision doesn't usually deteriorate any more. If you have dry AMD , you may have it for years and never develop the wet form. However, there are others who will develop wet AMD very quickly. But if you do have wet AMD in one eye, you have a greater risk of developing wet AMD in your second eye. Often the "good" eye will compensate for the "bad" eye. It is when the "good" eye is covered and one must see with just the "bad" eye that vision loss is so pronounced. If all of these risk factors are present the 5 year risk of choroidal neovascularization in the 2nd eye is 87%. Because of the more sudden and severe vision loss associated with wet macular degeneration, seeking effective treatment becomes a personal and family mission. It is best to become educated before you develop wet AMD, because it is often necessary to make very fast treatment decisions. Most cases of wet macular degeneration are the sub-foveal type - meaning the leaky blood vessels are beneath the fovea (the center of the macula). The two subtypes of wet macular degeneration are occult and classic. The vast majority of cases are occult or a mix of occult and classic. Occult CNV is the most common type and is the result of a slower leak compared to classic CNV. Because of the gradual leak, less fluid escapes and the macula does not become as elevated and uneven. Therefore there is typically a slower loss of vision. As the newly formed blood vessels leak, fluid builds up under the macula and raises it up from its normal position. This is what causes the early symptom of wet macular degeneration - straight lines appear all distorted. However, occult CNV can develop into classic CNV. It is often difficult to determine its origins or where the bleeding begins and ends even with an angiogram. Because it is hard to know where to treat this bleed, it is more difficult to treat. - 40% of wet AMD are this type; the leaky blood vessels are underneath the fovea and not readily defined. Of these three types of wet AMD it causes the least vision loss. √ Identified by a well-defined area of new blood vessel growth in the macula. √ Involves a more severe and rapid vision loss than other types of choroidal neovascularization, such as occult CNV. However, the lesions that are viewed during your eye exam are not that black and white - i.e either you have classic AMD or occult AMD. Your ophthalmologist may see some of each in your eye - a combination of classic and occult. This makes treatment decisions more complicated. Listed below are the four different types of choroidal neovascularization. No occult component to this type of CNV. The lesion is only composed of classic CNV. A predominantly classic CNV is defined by a mixture of the classic and occult, with the classic component making up more than 50 % of the entire lesion. 2)the occult component is more than 50% of the lesion. No classic CNV component, only occult. This subtype of wet macular degeneration has less leakage which means that the vision loss is not as rapid as the classic subtype. The minimally classic and occult types account for around 75% of those with wet AMD. Research efforts are more focused on wet macular degeneration rather than dry macular degeneration. A complete listing of macular degeneration clinical trials can be found at www.clinicaltrials.gov. 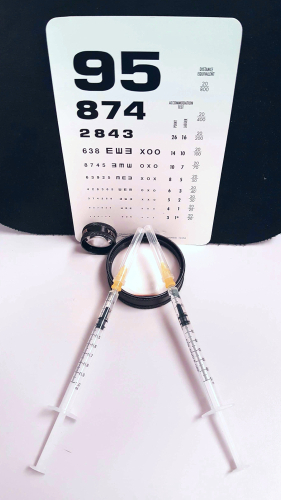 To find our more about clinical trials for wet macular degeneration click here.